Please read on after the jump for closeup swatch photos and reviews! 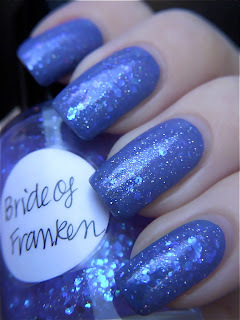 Bride of Franken is a translucent lavender base awash with bright pinpoint holographic dust, fine pink and blue sparkles, and electric blue glitter in a myriad of shapes and sizes. The flickering sparkles and luminous glitters create a radiant ethereal look. "Your nails are GLOWING!" was the best description of the effect. The Bride's formula was wonderful. The glitter and sparkles distributed perfectly onto every nail. The Bride needs only one coat of top coat. No glitter smoothing needed. Llarowe currently stocks Lynnderella polishes and posts frequent updates about when new stock will be available. 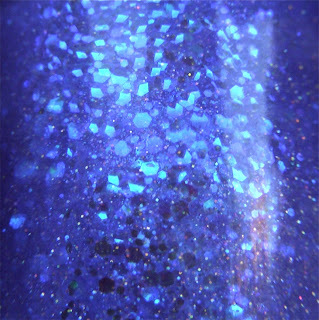 Lynnderella's blog has wonderful photos, swatches, and information about her polishes.